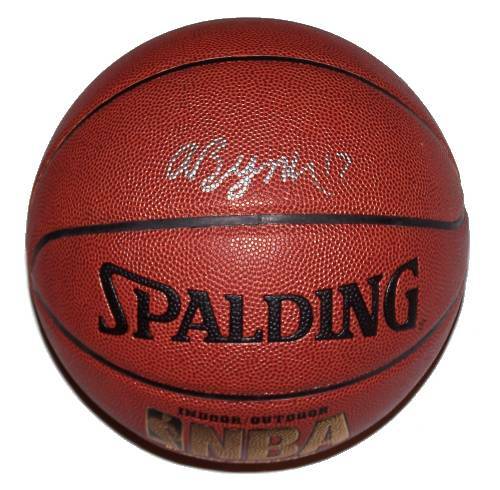 A Spalding NBA basketball signed by Andrew Bynum of the Los Angeles Lakers. Comes with Certificate off Authenticity. 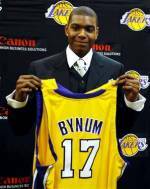 Andrew Bynum is an American professional basketball player who plays for the Los Angeles Lakers of the NBA. He was drafted 10th overall by the Los Angeles Lakers in 2005. Bynum became the youngest player ever to play an NBA game later that year, breaking Jermaine O'Neal's record. Amidst the 2007?08 season, he suffered an injury on his left kneecap and eventually missed the rest of the season and all of the playoffs. He made a successful return at the beginning of the 2008?09 season. In January 2009, however, he suffered another injury, this time to his right knee. He was able to come back before the playoffs started and was part of the Lakers squad that won the 2009 NBA championship. In the 2010 post-season, Bynum played in every single playoff game with a torn meniscus and strained Achilles tendon and the Lakers repeated as NBA champions against the Boston Celtics. ~ Wikipedia.